Silver Flash Butterfly Bottle Opener | BUDK.com - Knives & Swords At The Lowest Prices! Your friends won't think you're the coolest bartender ever, they will know it when you whip out this Silver Flash Butterfly Bottle Opener. Open it fast or slow, but you'll always be prepared to get your party on with this guy in your pocket. 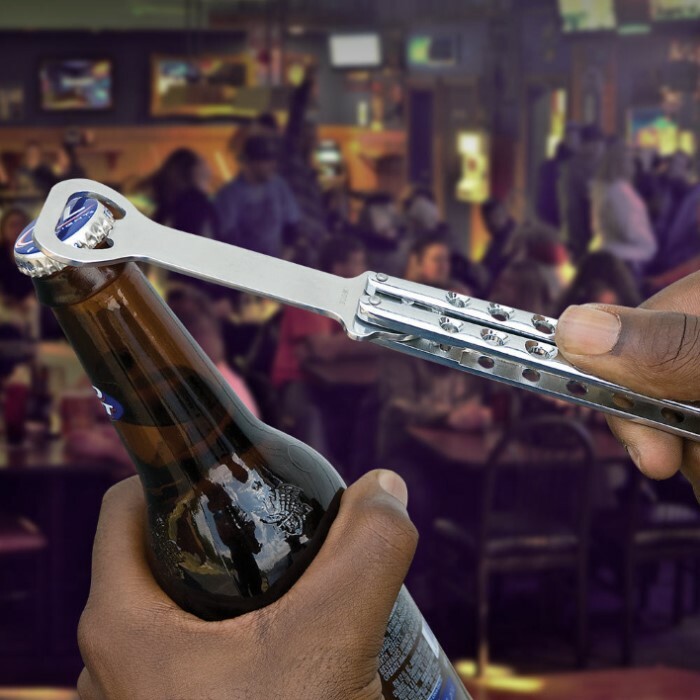 Constructed of stainless steel, it opens like a butterfly knife and has a locking catch. 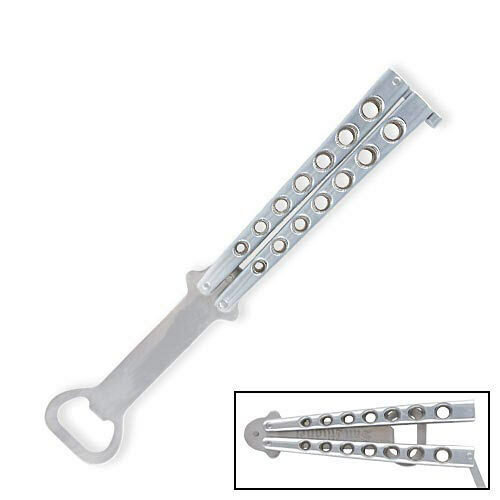 You can also use it as a training tool for butterfly knife tricks without the risk! Ever wanted to try a butterfly knife out? How about starting off with this bottle opener first? It pops tops like a boss! I'd had my eye on this for a while, so when it went ion sale at the price I bought it for, I just had to get it. It arrived quickly as most items from BudK do (in my experience). I was surprised at the weight of this, because I have a butterfly knife that is lighter that this is. (Don't worry, it is a good weight and doesn't prevent me from using it.) The weight is more a sign of the quality. I work with professional bartenders, and they were all impressed with it. It could standup to all of the bottles they open. And the flair of flipping it open could boost their tips. My one "criticism" is that the sides of the bottle opener stick out when this is closed,so it feels odd in your hand compared to a butterfly knife. But, it isn't really a big deal and you get used to it. All in all, I'm very pleased with it. If you have bottles you need opened, this is the right tool for the job. Not only is it functional, it is a lot of fun! This is the coolest bottle opener I have ever seen and work well too. Everyone that drink a few beers should own one. Its pretty cool, but I wish I had anticipated the fact that I have no bottles to use it on! Overall, very nice, but the pins are quite loose. Very cool for the novelty. I just think the way its weighted is not suitable for a lot of tricks.